On the evening of Fri­day, August 17th, 2018 some­thing very impor­tant hap­pened in the world of stream sci­ence and man­age­ment. The Eso­pus Creek, Birch Creek, and Wood­land Creek reached “bank­full discharge”. Bank­full dis­charge is the amount of water flow­ing in the stream when the chan­nel is com­pletely filled to the brim, mea­sured in cubic feet per sec­ond (cfs). At bank­full, all the water is still con­tained within the chan­nel. Once bank­full has been exceeded, water spills out onto the flood­plain and the stream is tech­ni­cally flood­ing. The pho­to­graph below shows the Stony Clove Creek at near bank­full flow. The unde­vel­oped flood­plain vis­i­ble on the left is acces­si­ble to the stream and ready to accept any flood waters in excess of bankfull. 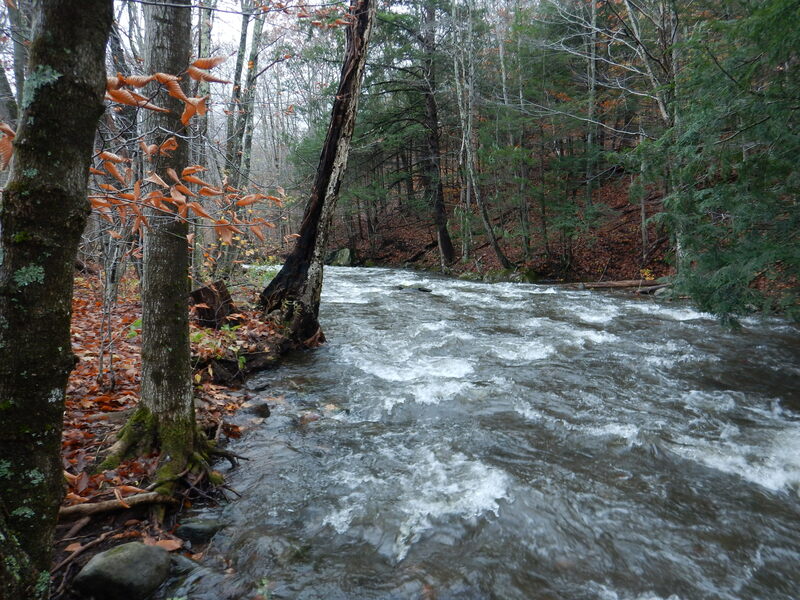 In the humid north­east, most streams will see a bank­full flow event every 1.5 years on aver­age. The last time we saw a bank­full flow in the Ashokan water­shed was Octo­ber 2017. If any flow over bank­full means that the stream is flood­ing, then we can expect our rivers and streams to flood at least once every year and half. This is nat­ural, sta­ble stream behav­ior and high­lights the impor­tance of flood­plain management. Bank­full dis­charge is crit­i­cal to stream man­agers because over time it is the flow that moves the largest amount of sed­i­ment, effec­tively shap­ing and main­tain­ing the chan­nel form. Due to the impor­tance of bank­full dis­charge for chan­nel main­te­nance, some of the research projects that we fund at AWSMP have trig­gers that are acti­vated fol­low­ing bank­full flow events. Below is a chart that com­pares the stream flows observed on Fri­day the 17th (far right) to bank­full dis­charge. The Q1.5 col­umn is an esti­mated bank­full dis­charge based on sta­tis­tics. This is a use­ful esti­mate for bank­full when field derived val­ues are not avail­able. The most accu­rate way to deter­mine bank­full dis­charge is to read the stream. A well-trained eye can locate bank­full indi­ca­tors in the field such as depo­si­tional fea­tures or changes in bank slope, veg­e­ta­tion, and par­ti­cle size. By using these indi­ca­tors as a guide to mea­sure the dimen­sions of the stream chan­nel, highly accu­rate bank­full dis­charge val­ues can be cal­cu­lated (mid­dle column).